Win his moisturizer that GQ says is "the best on the planet"
Halloween's right around the corner which always reminds me of our shaving cream business entrepreneur, model, and Halloween costume model (my favorite DT post!) Kyle Schroeder (W'01). and Fog Free shave mirror! In the past on DT, I've covered stories about Kyle's shaving cream and the great video he produced which gives his backstory. 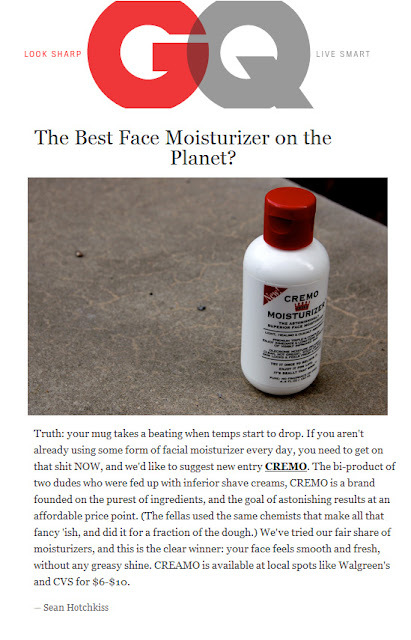 Recently, Kyle added a fantastic new Cremo moisturizer to his product line which was mentioned by GQ as "the best moisturizer on the planet" (see article below in post). 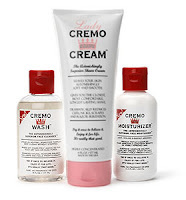 1 winner will be chosen at random from eligible applicants retweets to receive a gift basket (via mail) of 1 tube of Cremo Cream, 1 tube of Cremo wash, 1 tube of moisturizer and 1 Fogless Shower Mirrors . To decide the winners of this competition, I will place each entry into a numbered list in the order the entrants comment was received. Using Research Randomizer, I will first select one random entry according to their number who will win. I will contact the winner about his/her prize as soon as the draw is completed and will announce the winner on this blog soon after. Winner will be notified via the twitter account they retweeted their entry from no later than Monday, November 5, 2011. Try It Once to Believe it. Enjoy It For Life. It's Really That Good. Most shave "creams" and "gels" are actually foam -- which is primarily air. Visualize a sharp blade scarping across your delicate skin with air as the main "lubricant." It tears your skin, creates little cuts and nicks that bleed, and leaves your skin looking and feeling rough. 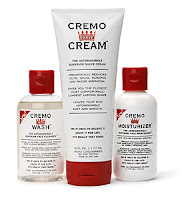 Cremo has no air: It's an extremely rich cream (even more so than other similar/non-foam luxury shave creams). It contains unique, super-lubricating, highly-slippery molecules that have been compounded with powerful skin conditioners. Together, they make your blade glide smoothly over your skin astonishingly soft and smooth. I think you will find this is better than anything else you have ever used. Try it once to believe it. Enjoy it for life.